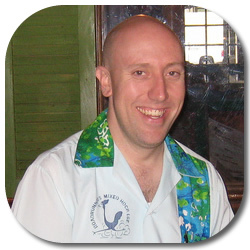 Martin Cate is an internationally recognized expert on rum and Tiki drinks. Over the years he has taught classes, tended bar, designed beverage programs, been featured in publications such as The New York Times, The Wall Street Journal, USA Today, and appeared on shows like The Today Show. In 2009 after several years working behind the bar at Trader Vic’s and Forbidden Island (where he was part-owner), Martin struck out on his own and will be opening a new venture in San Francisco, Smuggler’s Cove. Smuggler’s Cove will be a rum haven run by one of the great advocates of the spirit, and great friend of this blog. I figured it would be a good idea to catch up with Martin and get to know a little bit more about the project and the man himself. In the process I got to learn a little bit about what makes him tick, what Smuggler’s Cove will be about, and a great big surprise that you may find on the menu there. There just isn’t a more fascinating spirit in the world…. Revolution, triumph, piracy, war, sailors, celebration, and unspeakable human tragedy are in every glass. No other spirit has the history or the versatility. From the fiery aguardientes of 300 years ago, to the polish of 19th century Spanish styles, to the richness of the English style rums and delicacy of the French rhums- I mean, it’s amazing. And all the incredible applications- what other spirit can trace its history from harsh grogs, to colonial tavern specialties, to the elegant cocktails of Havana’s golden age, to the baroque and incredible compositions of the mid-century exotic cocktail. Plus it’s yummy. You’re primarily known for your work on the Tiki side of rum mixology – you got your start bartending at Trader Vic’s in Emeryville and then went on to open Forbidden Island – but Smuggler’s Cove (as I understand it) is not a Tiki bar. What is the main idea behind Smuggler’s Cove, i.e. what can a customer expect to find on the menu? Will there be any tiki? I started out my voyage with exotic cocktails. But…once you open the door to find that beyond the 30 or so glorious years of the heyday of exotic cocktails, there lies 300 more years of incredible history. The more I dove into rum, the more I loved unearthing its history and tasting the old magic. So my idea with Smuggler’s Cove was to say- there’s a bigger world of rum out there, and I want people to come and explore it with me. That’s why you’ll find a much larger and more elaborate palate of drinks. Having said all that, I still carry a deep and burning tiki torch of love in my heart for vintage exotic cocktails. You will most certainly not be want for a classic tiki cocktail at Smuggler’s Cove. In fact the Smuggler’s Cove menu will feature a NEVER BEFORE PUBLISHED Don the Beachcomber recipe from 1937, courtesy of Jeff “Beachbum” Berry. That’s right- straight from the bartender’s notebook. Previously lost to the ages. Not even in the Bum’s new book. As to the decor – remember that good classic tiki decor is a number of elements working in harmony – carving, thatch, bamboo, salvage, nautical, tropical plants, flotsam & jetsam, etc. Smuggler’s Cove will be emphasizing some of these features over others. In essence, I can virtually guarantee that no tiki enthusiast will be disappointed by the interior. It will appeal to a lot of people’s interests- vintage SF decor, nautical, even pirate. I’m not calling it a tiki bar, because I want it to be what you want it to be. But if you call it a tiki bar- hey, you bet I’m not going to be insulted. My interior designer is an evil genius and there are many tricks up our sleeves…. Smuggler’s Cove is going to have its own rum, Eurydice, that you worked on with St. George Distillery. What made you decide to work on a unique house rum, and how did Eurydice come to be? I had been wanting to do this for many years, and the ball got rolling some time ago with the distillers at St. George. When they said they had a source for California Sugar Cane, we got to work. They pressed four different kinds of sugar cane and fermented them with different yeast strains. I tasted them all off the still and settled on two distillates that in discussion with the distiller, we felt had the most potential to age well and bring the kind of aromatic notes to the forefront that I wanted. So we chose two and put them in French Oak together for six months, then off to used bourbon for another six. What can a customer expect from Eurydice? Why is it special? There is truly no other rum like it in the world- a 100% California produced artisinal product. No one else is producing a fresh-pressed, agricole-style cane rum in the United States. What’s really exciting is that I think it’s a great compliment to all of the other small US distillers who are making some great rums. It really stands well along side them yet remains distinctive. Are there any plans for a Rum Tasting Club of any sort? There will most certainly be an amazing tasting club at The Cove…with a real sound educational component that helps to deepen and enlighten people’s understanding of this mighty spirit. It’s going to be a lot of fun. What is important to me is that people come out of the experience with not just an understanding, but a good idea of some of their favorites. I want people to find rums they love- the worst thing for all of us is for people to only try a rum that isn’t to their taste and write off the whole category as a result- I want to get consumers to fall in love with a rum they haven’t met yet! It seems like it was only yesterday that you were making drinks on the other side of the Bay, and now Smuggler’s Cove is set to open before the end of the year. How were you able to effect such a quick turnaround? Consider it a combination of dogged hard work and good fortune. Finding a bar-only liquor license in SF is exceptionally hard. I was able to get in and make it work fast. Now I only wish I had more time! I asked Martin if there would be any big names (other than his) working behind the bar at the Cove, but he was incredibly tight-lipped when it came to which Bay Area all-stars might be spending some time shaking a few cocktails for rum enthusiasts. Martin was similarly evasive about the details of the long-lost Don The Beachcomber recipe he’s reviving at the Cove. While there is no specific date yet set for Smuggler’s Cove to open its doors, expect Martin to be unleashing his new vision on the world some time in the Fall of 2009.